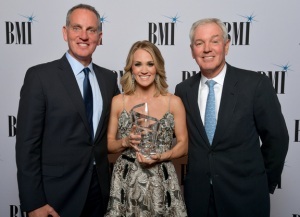 CARRIE UNDERWOOD IS HONORED BY BMI. 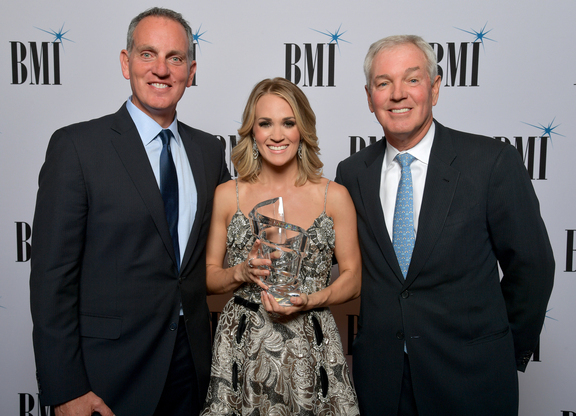 Carrie Underwood was honored at the 69th annual BMI/NAB Dinner held this week at the Wynn Encore in Las Vegas. Carrie was recognized with the BMI Board of Directors Award for the impact her music has had on the broadcast industry, as well as her many contributions as a songwriter. With her string of radio hits, groundbreaking videos and television performances, Underwood was the ideal recipient of the BMI/NAB honor. Hosted annually by the BMI Board of Directors, the annual NAB dinner salutes the Directors of the National Association of Broadcasters (NAB) and celebrates the longstanding partnership between the songwriting community and the broadcast industry. Past recipients of the BMI/NAB honor include Dolly Parton, Willie Nelson, Graham Nash, Paul Simon, Carlos Santana, and John Williams, among others. Carrie Underwood emerged from the promise of her 2005 American Idol win to become a true multi-format, multi-media superstar, spanning achievements in music, television, and film. A seven-time GRAMMY® Award winner, she has amassed over 100 major honors, sold 64 million records worldwide, and recorded 25 #1 singles, 13 of which she co-wrote, with a catalog of songs that have been streamed more than 2.6 billion times worldwide. 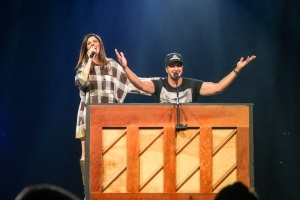 The first female artist to be twice named the Academy of Country Music’s Entertainer of the Year, Underwood was recognized by Pollstar as the top female country touring artist for each of her headlining tours in 2008, 2010, 2012, and for 2016’s “The Storyteller Tour – Stories in the Round.” Underwood also topped Billboard’s Top 25 Tours of 2016 as the leading female country artist and was the leading female artist on Country Aircheck’s top country radio performers list for her success in both 2015 and 2016. 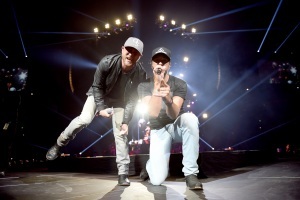 All five studio albums, Some Hearts, Carnival Ride, Play On, Blown Away and Storyteller – are certified Platinum or multi-Platinum, and each an American Music Awards winner as Favorite Country Album – and tallied an incredible 40 weeks at #1 on Billboard’s Top Country Albums chart. The RIAA’s highest certified country album artist to debut this century, Underwood also holds the distinction of the highest album certification of any country artist to emerge since 2000 with the 8x Multi-Platinum success of her 2005 debut, Some Hearts. She is the all-time Top Country Artist (male or female) on RIAA’s Digital Single Ranking, also placing her among the Top 5 females in the history of RIAA’s Digital Single Program across all genres. In December of 2014, she released her Platinum-certified Greatest Hits: Decade #1, which produced two new #1 hits co-written by Underwood, including the RIAA-Platinum, GRAMMY-winning “Something in the Water.” 2016 marked Underwood’s fourth season as the voice of primetime television’s #1 program, Sunday Night Football, and in November, she returned for a ninth consecutive year as co-host of the CMA Awards. The Grand Ole Opry member also demonstrated her diversity in 2013, starring as Maria von Trapp in NBC’s three-hour holiday blockbuster, the Emmy®-winning The Sound of Music Live!, whose airings attracted 44 million viewers. 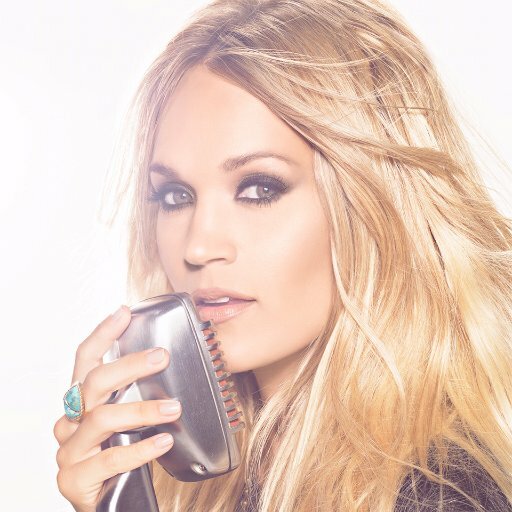 The reigning CMA Female Vocalist of the Year, Underwood recently claimed her fourth win in the category amid the ongoing success of her chart-topping fifth studio album, Storyteller – the only country album to launch to Platinum certification since the time of its release in October of 2015. ** Underwood received the nine Million-Air Certificates for the following songs: “Cowboy Casanova” (2 million plays), “Last Name” (2 million), “Undo It” (2 million), “Heartbeat” (1 million), “ Little Toy Guns” (1 million), “See You Again” (1 million), “Smoke Break” (1 million), “Something in the Water” (1 million), and “Two Black Cadillacs” (1 million). 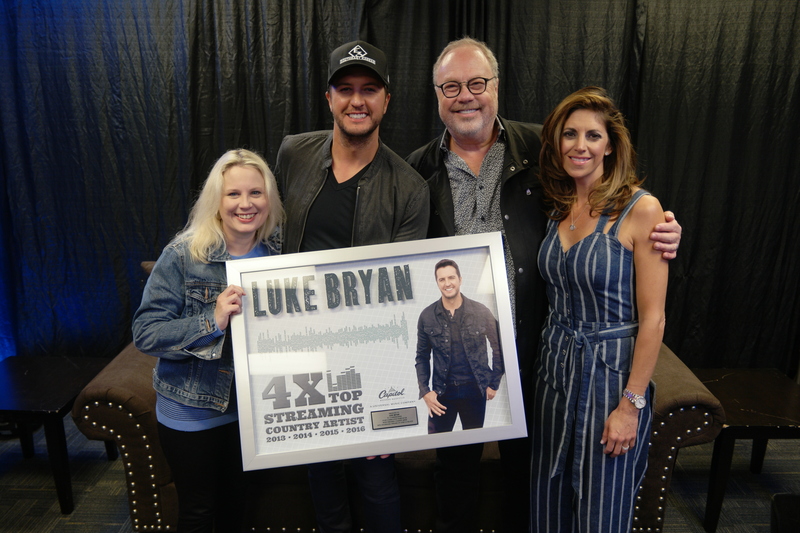 She has already received “Million-Air” Awards for the following songs: “All American Girl” (2 million), “Good Girl” (1 million), “Mama’s Song” (1 million), “So Small” (1 million), and “Temporary Home” (1 million). CARRIE UNDERWOOD PERFORMS THE NATIONAL ANTHEM PRIOR TO GAME THREE OF THE FIRST-ROUND STANLEY CUP PLAYOFFS BETWEEN THE NASHVILLE PREDATORS AND THE CHICAGO BLACKHAWKS. Carrie Underwood surprises the crowd prior to the first-round NHL Stanley Cup Playoff Game between the Nashville Predators and the Chicago Blackhawks by singing the National Anthem. 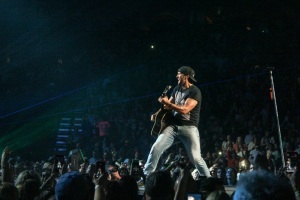 Her husband Mike Fisher is the captain of the Nashville Predators, and she sported his No. 12 jersey and blue and gold nail polish as she sang “The Star Spangled Banner.” The Predators won in overtime over the Blackhawks 3-2 for a 3-0 lead in the Western Conference quarterfinals. The next game in the series will be Thursday night in Nashville (or “Smashville” as the Predators nicknamed Bridgestone Arena during games). 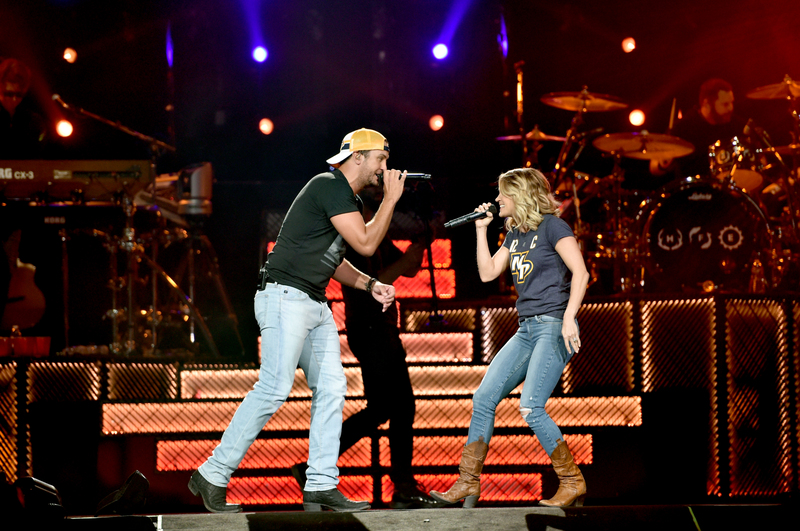 CARRIE UNDERWOOD SIGNS WORLDWIDE DEAL WITH UNIVERSAL MUSIC GROUP. 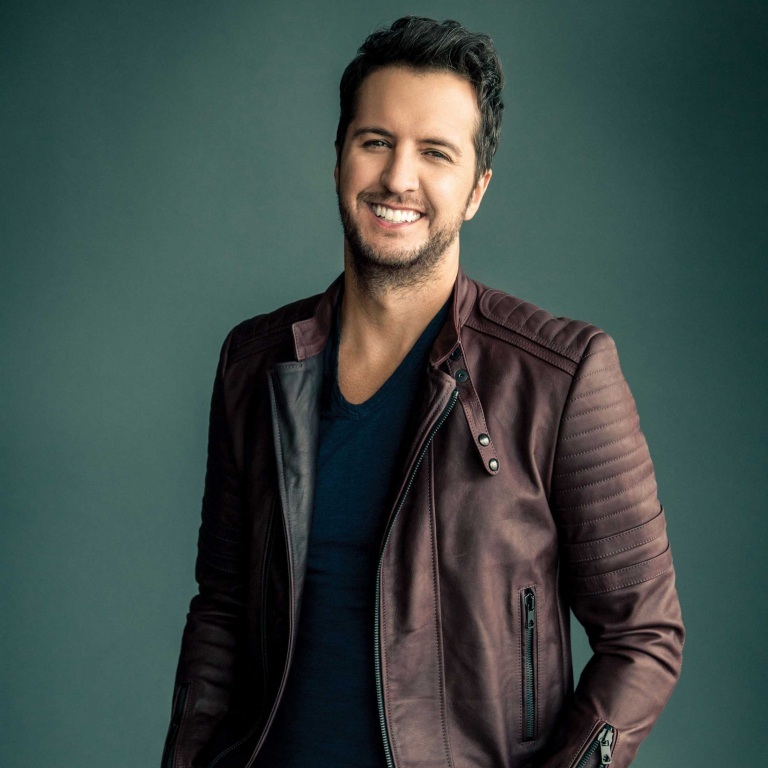 Universal Music Group announced a new worldwide recording agreement with seven-time GRAMMY® Award winner and two-time ACM Entertainer of the Year nominee, Carrie Underwood, on Tuesday (March 28th). Underwood’s label home will be Capitol Records Nashville, one of four labels that form Universal Music Group Nashville, and Billboard country label of the year for eight consecutive years.